1) Keep the consumables clean (Figs. 1, 2). 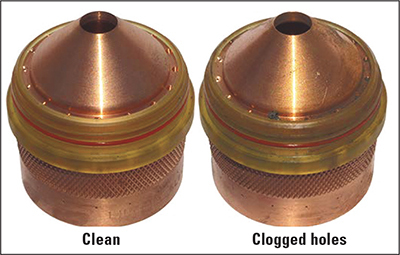 Buildup of dirt, grease and metal dust from daily use can easily clog the small holes in the swirl ring and inner retaining cap. These holes are of a specific diameter and direction as to create a vortex of plasma and shielding gas, to constrict the arc. Contaminated holes will cause the plasma arc to become skewed, resulting in poor cut quality. Wipe down pieces with a clean shop towel every time they are removed from the torch. 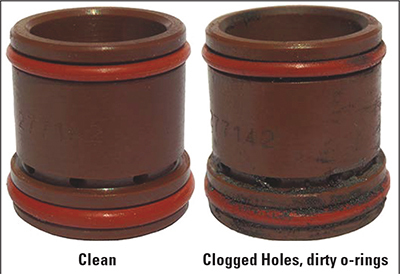 When not in use, properly store the swirl ring and retaining cap away from contaminants. 2) Use the correct plasma-gas pressure. The plasma-gas pressure setting must remain as close to that prescribed in the cutting charts as possible. 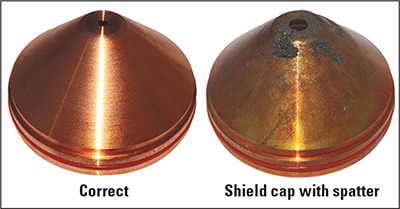 If pressure increases by more than 5 psi, electrode wear will significantly increase. If pressure decreases by more than 5 psi, the nozzle orifice will rapidly become out of round, reducing cut quality. 3) Verify proper piercing height (Fig. 3). The time it takes for the plasma arc to pierce through the workpiece can be as long as 4.5 sec. During this time, the molten steel is being forced upward by the intense gas pressure. Piercing too close to the plate can damage or destroy a shield cap after as little as one pierce. 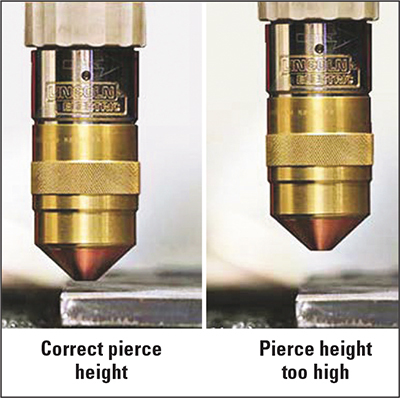 Conversely, using a pierce height too far from the workpiece can cause a misfire, diminishing electrode life. Use the correct pierce height for the material thickness, as prescribed in the owner’s manual. 4) Don’t forget the o-ring lube (Fig. 4). Use just enough lube to put a slight sheen on the o-rings. Too much lube will attract dirt and dust particles, while too little can result in a damaged o-ring. 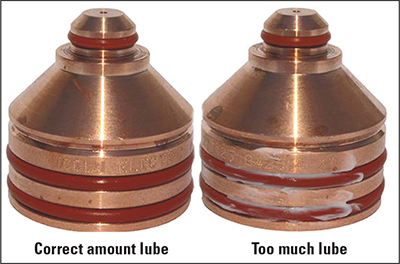 With a damaged o-ring, gas and coolant can mix inside the consumable chamber of the torch, reducing cut quality. 5) Do not add a circular lead-out when cutting holes (Fig. 5). Once the torch has completed cutting the perimeter of a hole, the leftover center slug will drop out. On holes with a lead-out, this happens before the plasma power supply can perform an orderly shutdown of the arc. The arc instantly snaps off when the cutting current loses its path to ground, resulting in a significant reduction in electrode life. Instead, use the nesting software to include a small amount of overburn to clean-up the hole. 6) Maintain proper air filtration. Air supplied from a shop compressor often can be contaminated with dirt particles, water, oil particulates and oil aerosol. Proper filtration is paramount to achieving optimum cut quality and consumable life. Moisture in the air can disrupt the plasma-gas mixture, resulting in a deformed arc, while oil particulates and oil aerosols can cause electrode, nozzle or even torch failure. 7) Remove material buildup from the shield cap (Fig. 6). If the torch drops down from the set pierce height too soon, or inadvertently pierces too close to the workpiece, molten splatter can attach itself at or around the shield-cap orifice. Most times it can be removed easily using an abrasive hand pad (not sandpaper). If this spatter is not removed, it can lead to double-arcing, which can damage the electrode and nozzle. 8) Stay within prescribed process parameters. Do not attempt to pierce or cut material that is outside the capability of the selected amperage. This will greatly reduce the life of the shield cap, and possibly destroy the nozzle and electrode in as little as one pierce. 9) Verify all consumable-part numbers. Mixing up consumables from different amperages will result in poor cut quality or misfires, and can cause immediate damage. Some cutting systems automatically display the required consumables for the selected process, material, thickness and amperage. The owner’s manual also contains the correct part numbers and pictures of each consumable. 10) Read the owner’s manual. Article provided by The Lincoln Electric Co., Cleveland, OH, www.lincolnelectric.com.